This historical novel plays out in the colorful settings along the Nile during the reign of Aha, Second King of the First Dynasty of the Old Kingdom in Ancient Egypt (3080 BC). It is an engrossing saga of court intrigue, forbidden love, ferocious battles, betrayal and murder. The characters in this multi-faceted epic range from compelling to fascinating, from likable to ambitious to suspicious, to plain unsavory. In the fore is Ramose, High Priest of Ptah, mentally exchanging poisoned lances with the vile Vizier Ebu al-Saqqara, as both vie for power over a weak king and his young heiress. During a forbidden encounter between King Aha’s first Queen Mayet and a nocturnal visitor, a new life is conceived; but its soul, its eternal Ba, is already old. And it is destined yet to live through many other storms. As the dreaded Khamsin rages over the Valley of the Nile, Ma’at is often breached and it is said that people vanish without a trace. Yet, for the eternal soul, the end is but a new beginning. 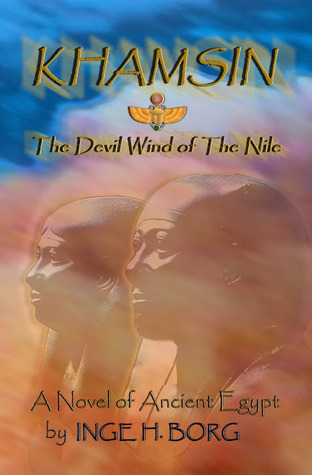 “Khamsin: The Devil Wind of the Nile” by Inge H. Borg is a complex story set in Egypt ca. 3080 B.C. Knowledgeable and armed with plenty of research the author paints a very authentic feeling picture of the Egyptian court with its intrigues and many-fold players: the priests, the generals, the wives and children, the servants and so forth. The book is full of small and bigger stories involving a huge ensemble cast, making this a great read that gives multiple insight into the life as we have to imagine that it could or would have been. With great insight into human nature and a colourful imagination Borg manages to enrich the reading experience with plenty of ideas and stimulating thoughts. There s a lot to be learned about the priesthood, the weapons, transport and warfare, the religion and life in the desert country. This was quite a captivating read and a well illustrated work of art. The themes may not be innovative – adultery, questionable paternity, war, competitive men to name a few obvious ones – but that did not stop me from caring for the characters and their fortune during the novel, especially when the title character Khamsin, the devil wind of the Nile, befalls the country. Although the author claims in the foreword that this is not a work of science but of art, the writing has a confidence and an air of authority that gives this ‘entertainment’ an extra value. If you like an unusual setting for your books or love ancient history this is a book worth reading. From early on, I was passionate about books and spent a lot of time reading. That led to becoming a good speller. It also nurtured my apparently natural (or maternally inherited) penchant to write. My teachers often made me read my essay to the class (which softened them up when it came to my deplorable Math grades, an inherited trait as well, as my mother bluntly informed the school. I was allowed to graduate). Being a secretary was not a bad career in my day. Speaking and writing several languages with shorthand (and my willingness to keep my bags packed) provided the springboard that catapulted me out into the world. Also (in my day), one stayed in touch with family and friends by writing copiously (at least, I did for my part). The recipients always spouted how much they loved my letters; if only they could decipher them. Penmanship was not one of my noteworthy accomplishments. I loved my IBM Selectric, and when they tried to foist my first computer on me, I balked pressing my typewriter protectively to my bosom (or vice versa). Little did I know how many grateful hours I would spend over my new keyboard. We are on quite familiar terms these days, and my laptop is high on my to-be-saved-in-case-of-tornado list; right after the cat and my pearls. How did you come up with the idea for your books? It sounds banal, but someone said “you should write a book.” Oh, wait. That was usually suggested after I had regaled a girlfriend or two with some of my life’s interludes. Seriously though, there was somebody who suggested that “I could write a book,” and rattled off snippets of an Egyptian saga. I laughed. No way. A couple of weeks later, I showed him the first chapter. However, when he realized what was involved—research, and—oh my—spelling and correct word usage (he was a veritable Mr. Malaprop), he lost interest in this clearly non-get-rich-quick scheme. But I was hooked. As the time was “B.G.” (Before Google), and I poured over ever-conflicting research material about Egypt’s Old Kingdom. In the end, the 250,000-word manuscript (and its many pink slips and cancelled checks from bogus-agents) rested buried in a drawer for twenty years while I kept writing long letters home. It was not until Amazon’s e-book swell struck a chord. I re-edited Khamsin, chiselling it down to 150,000 words (with those tossed 100,000 words, “I could have been somebody”). After Khamsin was selected as an “Editor’s Choice” by the Historical Novel Society, the fires were lit—I wrote Sirocco over the following eight months, and published three other minor works. I now have the time and—one should grant me—the tenacity, to work all day, every day on my writing. That is a great luxury—and I have never been happier (well, not lately anyway). What is your connection to Egypt? Pure imagination; possibly arrogance thinking I could write about it. I have no background in Egyptology nor in any other archaeology. Books with exotic settings fascinate me. However, writing about locales I knew nothing about was a bit like walking into a minefield; it took a lot of tiptoeing, and even more research. Luckily, so far, I was only “admonished” about one supposed mistake, using “Royal Bark” instead of “Barque.” I could prove that I was not wrong. This reader actually did me a great favor because I went back and painstakingly re-edited the book one more time. After which that reviewer graciously changed her ranking from 3 to 5 stars. What made you think of writing historical fiction? Did you ever consider other genres? I am too passionate to limit myself to a one-formula-type of style, despite the sad fact that this is what seems to sell an author these days. Even though the pundits tout that it is counter-productive to change genres, I would eventually get bored (though it would save a lot of research). Actually, the second book in the “Legends of the Winged Scarab” series, Sirocco, Storm over Land and Sea, is a present-day thriller. It does have tie-ins to archaeological treasures from Khamsin, as will the planned Books Three and Four—each will play out during in very different places and times. I also wrote a non-fiction book about my days as a shelter volunteer—and “the darn cat” that got the better of me. My WIP, Mountain Shadows, might fit into a new category even though I did not know that’s what I was writing until I saw a Goodreads group that wants to breathe life into Boomer Lit. Historical Fiction—Too boring, scholarly, irrelevant? The emphasis here is on fiction. While I don’t write steamy, explicit stuff, there is plenty of action, innuendo and human deviousness in Khamsin. People then as now have their strengths and weaknesses, their foibles, ambitions and desires. It just plays out at a different time, in a different place. We, in our flawed humanity, have not changed for the better—nor will we do so any time soon. There must be balance. The tendency “to show” what one knows is always there. To keep it from coming through as condescending, or even boring, surroundings, customs, etc. need to be woven into the action unobtrusively. If the reader feels he is there, even if he learns something new, you succeeded. There are plenty of knowledgeable readers—so you had better be accurate. Particularly for Egypt, debates are being waged regarding the use of current names for cities and deities versus the Greek labels bestowed upon a conquered land. I mostly opted for the old Egyptian names (with an extensive glossary), but kept a couple of familiar gods. Tell us briefly about all of your books. Sirocco, Storm over Land and Sea is Book 2 of the “Legends of the Winged Scarab.” It is a present-day thriller with tie-ins to Khamsin, but stands alone in its action. 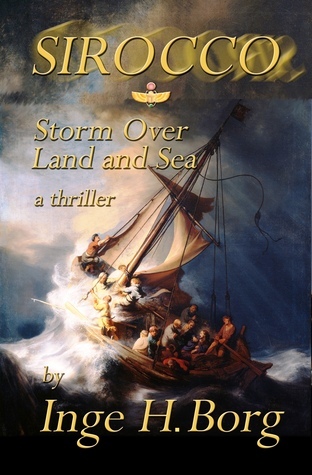 By the way, I was counseled against using a stolen Rembrandt painting as my cover—but I thought the public domain image portrayed ‘the perfect storm’ and I wove it into my story. Recently, the FBI issued a poster asking the public for help in the recovery of this work of art—something which I had already done in my foreword the prior year (there is a $5 million reward). Edward, Con Extraordinaire, is a collection of short stories of a charmer’s San Diego escapades; it does have tie-ins to Sirocco, in which Edward turns out to be less gallant. Pasha, From Animal Shelter to A Sheltered Life – non-fiction mentioned above. Moments of the Heart, A Book of Poems and Short Prose – an early collection of—yes—poems and short stories. Although by upbringing, education and travel, I am socially adept and have always had to deal with people, I am basically a solitary creature. This writing life now suits me; I revel in it. My least favorite things—and I am certain this is echoed by many fellow-authors—are editing and marketing. Trumpeting one’s name and titles onto indifferent ears, flogging unsuspecting readers with burps and blurbs, searching, weeding, hoping, giving away scores of books…it is painful to the artistic soul. Of course, any day turns aglow when a thoughtful review is posted, a reaffirmation that one might have produced a book worthwhile reading. My hat is off to those dedicated readers who not only read for their own enjoyment but take the time and trouble to post reviews and let especially us “Indies” know how a book resonated with them. When my cover designer, fellow-author Diana Wilder—who also writes about Egyptian history—sent me the cover for Khamsin, she had inserted a small Khepri, a winged scarab, into her wind-swept landscape. ‘How cool,’ I thought. Uploading a corrected copy of the book, I slyly inserted a paragraph for this scarab to become the personal seal of the high priest, chiseled onto the Golden Tablets that serve as the tie-in to Sirocco. For Sirocco, I again asked Diana to superimpose the small scarab onto that cover. Thanks to her inventive mind, I had my Leitmotif. The Legends of the Winged Scarab series was born (yes, there are two more volumes rattling around in my head). For sheer delight, I reread Peter Mayle’s Provence series every couple of years. It provides an escape for my earnest soul. Did you find it difficult to research? How did you research? Nowadays, the Internet is invaluable. If one takes its offerings with the proverbial grain of salt; and if one realizes what is public domain and what might not be. For instance, I was looking for a harbor on the island of Crete. And there was Loutro, tiny fishing village accessible only by water. Nothing could have been more perfect for my double-dealing yachties in Sirocco. What would your characters say about the book? Who are your favourite characters and why? I can’t explain why, from my myriad of characters in Khamsin, I often think of one who occupies barely half a page: Hanni, the Ostrich Egg Gatherer. Bent and battered, he lifts his rheumy eyes up at the High Priest in hopes of reprieve from his arduous tasks. His shriek, as he falls, still echoes. Clive Cussler. (Surprised?) He not only writes about adventure, he has lived it. His thrills and technologically futuristic ideas are amazing (or they were before he started to draw on all those co-authors). We’ll chat around the fireplace, over a Cognac. (I am a lousy cook). A) It’s a “dry” county—and I don’t mean it lacks for rain. B) Lots of lakes, woods and hills. Very quiet and peaceful. Sadly, I am not reading as much as I should or want. But my “to-be-read” list is growing, not in the least from your own writings and recommendations in this blog. High on my list are books by Diana Wilder, James Hockey, and Tui Allen’s Ripple, a dolphin’s tale. Last but not least, Christoph, I have just added your own writings. On Kauai, the least crowded of the Hawaian islands. Oh well, if it’s all paid for, then I would like to take a cruise up the Nile and visit all the sites in Upper Egypt, led by Dr. Zahi Hawass (but only if he is in a benign mood and wears his trade-mark Fedora). A contemporary novel called Mountain Shadows, slated for publication in May (the main character is one of Edward’s former victims). There is also a time-constraint, only noticeable for those who read Sirocco and paid attention to the epilogue. I write what I write with enthusiasm; I care about what I write; I like what I write with the hope that my readers might like it too. Christoph, thank you so much for including me in your great blog. You always bring new and interesting works to your followers attention. Count me in from now on. and it has a slight connection to Edward, Con Extraordinaire, a character from Inge’s book Sirocco. Born and raised in Austria, Inge H. Borg completed language courses in London and Paris. Continuing her study of French, she worked at the French Embassy in Moscow. Later, Ms. Borg was transferred by a Viennese company to the States, and subsequently worked on both coasts. After several years in sunny San Diego, she became a US citizen. Ms. Borg now lives in a diversified lake community in Arkansas, where she continues to write fiction. Her poetry has been published in over twenty anthologies and was chosen for professionally recorded readings. Her hobbies include world literature, opera, sailing and, of course, devising new plots for future novels. I read “Sirocco, Storm over Land and Sea” by Inge H. Borg as a follow up to “Khamsin”, her histroical novel set 3080 B.C., since I read that there were some connections between the two books. Having thoroughly enjoyed the first book I was pleasantly surprised to find Borg change direction from one genre to the next. Set in present day Egypt with its political unrest during the Arab Spring and beyond it tells the story of Archaeologists, Museums, art collectors and their procedures, rivalry and bureaucracy during an expedition to Cairo where ancient golden tablets are to be deciphered. Borg describes with great detail procedures and technology used in modern Archaeology and I settled in to a great contemporary book about Egyptology where the people and times of the previous book now have become the object of historical study. Just then two of the artefacts are stolen and a hunt through Greece and the Mediterranean Sea ensues. Thrown into this is also a love triangle and rivalry between several characters, all of which have different interests in the missing artefacts. 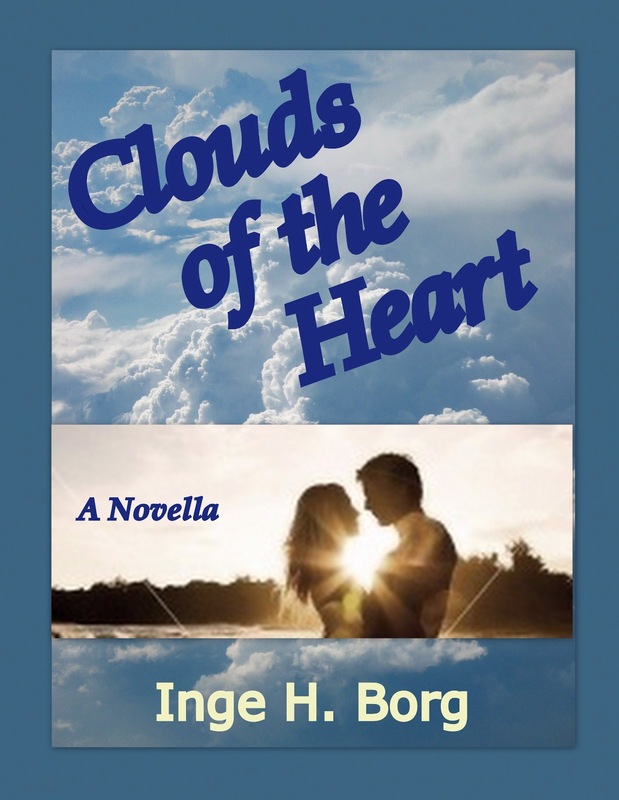 Borg enriches the plot with themes such as ancient curses to give you one more example of the broad spectrum of what to expect from this novel and thriller. I enjoyed this book even more than the first in the series and loved when the old turned up in the new. In that it helps to bring to live the first book again and to underline again the bringing to life of the past that good historical fiction can achieve. While we where living with the ancient Priest in the last book, now he is the author of an ancient scroll and a mysterious figure. The ancient storm, Sirocco, a symbol of the ‘blast from the past’ and the force of nature, which blows everything over, is a brilliant title for a book that has many more layers than I would have expected. Besides all of this, it has great suspense and intriguing characters. I am glad that I read Khamsin first to appreciate everything the author has put into this book, but for its story alone it does not need the predecessor. A great read. Thank you so much for asking me all those questions..they really made me think what this writing life is all about. And further, for posting your great reviews of KHAMSIN and SIROCCO as well…even more so for reading and liking them. You placed me into great company (present one NOT excepted)–and I look forward to learn more about your new writers and their great books. thank you for being here and for taking us to Egypt. I hope many people will join you on that worthwhile journey! Another great post. My TBR list is expanding.